Clear sky and brunch, possibly one of the best combination ever. Top Paddock doesn’t really need an intro right? 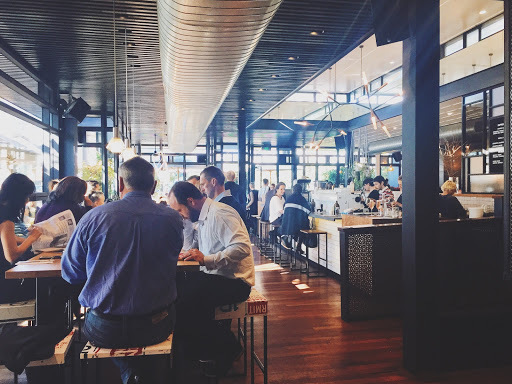 It is often seen as one of the best brunch places in Melbourne, which is quite a title imo, and the real question is, does Top Paddock live up to that? I went for chai instead of coffee, because I already had my coffee in the morning. It was served in a teapot that kept it warm, nothing out of the ordinary, but certainly hits the spot. Top Paddock isn’t really famous for its coffee, but they are up to standard. The cappuccino was very smooth, and I liked the latte art. The waitress highly recommended the daily special, so I decided to switch things around and not order the all-so-famous hot cake LOL. When it was first placed on my table, I was quite disappointed because it looked really plain. However, once I took a bite of the steak, my opinions changed completely, just goes to show that you should never judge a book by its cover! The steak was juicy and tender, and perfectly medium rare, I do wish it was cut a bit thicker though. I really liked the whipped wasabi butter too, such a simple yet innovative idea which pairs well with the steak! 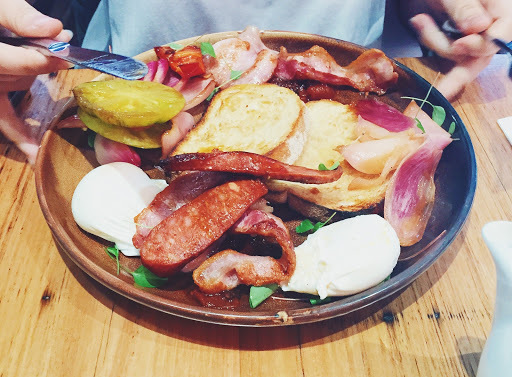 My friend went for the Top Paddock, their take on a big breakfast. There was definitely plenty on the plate – chorizo, bacon, eggs, pickled onion, peppers, green tomato. I love how Top Paddock gave this classic dish an elegant twist, down to the tiny pieces of basil, it really all comes down to detail. Random fact of the day: my friend’s so weird, she eats her poached eggs in one bite, as in, she literally chucks the whole egg in her mouth and just eats it o.o Does anyone else do this? A wait is to be expected at Top Paddock, but there is plenty of space once you’re inside, with several communal tables, seats alongside the bar, some more intimate tables in the back, as well as an outside eating area, the amount of light that comes through the windows makes the place so inviting. 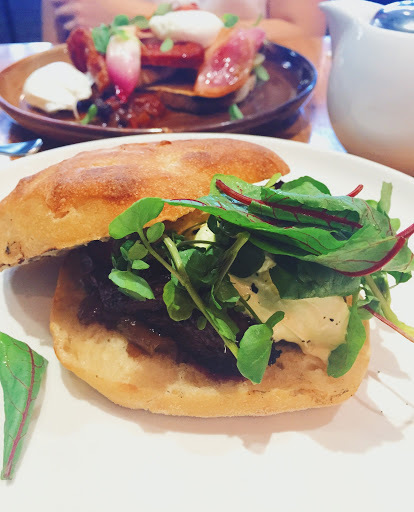 Top Paddock is a lot less pretentious than other brunch restaurants I’ve visited, and never fails to impress me with their food, which is why they will always have a spot on my list of the top 5 brunch places in Melbourne! Top Paddock is on Church Street, a 10 minutes walk from East Richmond Station, or if you’re feeling lazy, catch tram 78 or 79, and the stop is right outside of Top Paddock.